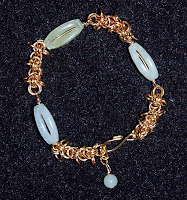 Basically, I followed the directions for the bracelet, adding wire-wrapped ¾” jade beads in between 1” lengths of chain maille. For interest and to make fastening the bracelet easier, I added a ½” length of chain to the end jump ring and used a head pin to add a ¼” round jade bead to the end of the chain. To the chain maille silver plated necklace I added 4 slider flower components and one floral 7/8”slider rectangle. The connections were made by fastening the upper two loops of each slider to the smaller double jump rings on the necklace using the extra jump rings from the kit. You can of course make the chain maille jewelry exactly as shown and have very fashionable, trendy pieces to wear. Initially, you may find the process of making chains tedious, but you will probably quickly get the hang of it and maybe create some designs of your own. Now I feel confident that I can make some chain jewelry from sterling silver and gold-filled jump rings that will have the desirable Chanel look. 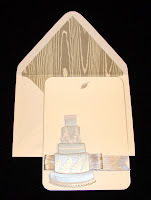 The wedding card is made simply from a dimensional wedding cake sticker, silver wood grain ribbon, and a printable card with a wood grain lined envelope (from the MS set). Adhere the ribbon to the card with Merikan double-stick tape. I think the ribbon really matches the card and envelope. Because the card is computer printable, you can print a photo of the couple along with the wedding date to personalize the card and make it a beautiful addition to a scrapbook page. 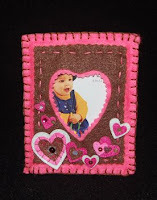 The baby card is sweetly simple. 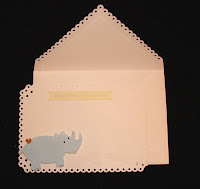 By putting pop-up dots behind the hippo sticker (peel off the sticker back first) and powdering (with cornstarch or baby powder) the sticky part of the sticker, you can add a dimensional look to the rather plain eyelet stationery. The welcome little one sticker seemed just perfect for the super simple new baby card. Of course you could add sticker or rubber stamped flowers if you have more time to spend. Make it quick, make it easy, and make it handcrafted…..
Other than craft books and magazines, my relaxation reading leans towards mystery/romance novels. I especially enjoy the Laura Childs series about tea and scrapbooking, and the mystery books by Monica Ferris, which take place in a needlework shop. Maybe it’s just me, but I love having pretty bookmarks to fiddle with while I read. (Click photo to enlarge.) It seemed only natural that I would create a bookmark from the Martha Stewart Valentine ribbon and stickers by K. and Co. (Smitten Grand Adhesions). 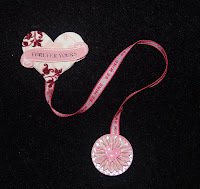 I placed the end of a 12” piece of “Be Mine” ribbon between two sticker medallions. The other end of the ribbon was positioned at the bottom of the “Forever Yours” dimensional sticker. Next I held a suitable photo up to a light so that the back of the photo was facing me. I press the “Forever Yours” sticker to back of the photo and then cut out the photo. Now I have a pretty new bookmark with a picture of my sweetie and me so I’ll enjoy reading even more! You might want to make a bookmark like this one and tie it onto a Valentine gift (a romance novel?) or include it on a card as a small gift. Just thought I would share some Valentine and birthday surprises I made. I don’t think the recipients of these gifts read my blog, so it’s a safe bet that I can share them with you without spoiling the gift giving. 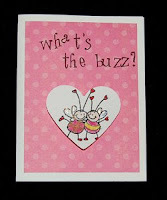 One of the two Valentine’s Day cards is for my sweetie (the card with the Bee Buddies - Hero Arts rubber stamp). I attached a spring coil (made from thin wire) between the heart and card using tape on each end of the spring. This gives the heart a jiggley bounce like a buzzing bee. The humor in the card and why I made it, comes from the fact that we have been having a bee problem at our house…. for years! Also in the inside of the card I wrote, “ You’re my honey-do guy!” because not a day goes by that I don’t ask my honey to do this or that. I’m so lucky because he does them too! The other Valentine’s Day card in the photo (click to enlarge) is a shaker type made from a Heidi Grace blank card with a window (set of 10 in a box). I like making shaker cards (with glitter, confetti, etc.) but I find it time consuming to cut the window accurately. Because these blank cards already have windows, most of the hard work is done. I recycled a piece of acetate and used double-stick tape to attach it over the window. Then I put ½” mounting tape (foam tape with two sticky sides) around the window, making sure there were no gaps. Next I filled the window with confetti. Finally, I adhered the backing piece of cardstock (placement of the cupcake design was determined before covering the window with acetate). The edges of the cardstock and card front were sealed with double stick tape. I think most young girls love to shop, so I usually send our young nieces money for their birthdays. However, I often feel guilty about giving such an impersonal gift. As a compromise, I usually try to make a small gift to go along with the cash. For the birthday of a niece born in February I made a pair of earrings. (See photo. Click to enlarge.) 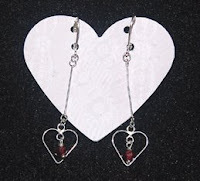 Although February’s birthstone is amethyst, I decided to use small faceted garnets because a reddish-pink stone seemed to go with the sterling heart dangle (earring back and dangles are from the Ben Franklin Bead Shoppe). The assemblage of the earrings was quick, requiring only a jump ring to join the earring back with the dangle and a head pin to attach the stone. 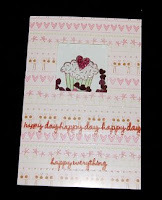 The cupcake card was easily done with Hero Arts clear animal, candle, cupcake, and best cake ever word stamps. Designs were colored in with color pencil, glaze pens, flocking and glitter. The “Happy Birthday” rub-on had to be traced over with a pen because it did not adhere well to the bumpy surface of the Heidi Grace window card. Oh yes, I added a spring to the back of the cupcake to give it some action and angled it in the window so that the candle would be a surprise and the animal looks like it’s holding the cupcake.